Olentangy’s Sean Marks (12) fires a deep jumper over a Westerville North defender during a league game last season in Lewis Center. The Olentangy boys basketball team had the best three-point percentage in the state last season. 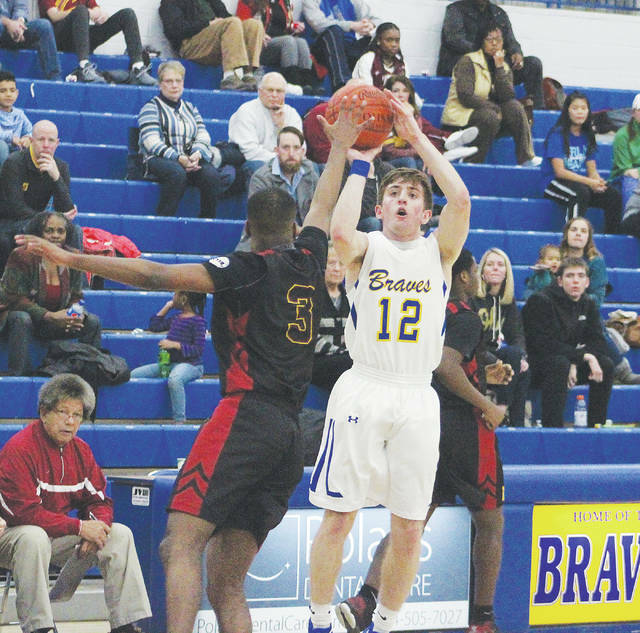 The Braves shot it well from the free-throw line, too … and it led them to a 14-win season. The shooting only got them so far, though. They finished 3-7 in the OCC-Buckeye Division, last in the league. In the postseason, they poured in 77 points in the second round of the Division I district tournament … and lost by nine to Chillicothe. Needless to say, head coach John Feasel said the defense has been a priority all offseason. The Braves return a good amount of experience, and plenty of talent, led by seniors Sean Marks, Luke Riedel, Alex Sieve, Noah Gossett and Caleb Steele. Marks nabbed Special Mention All-Ohio honors last year. Riedel is healthy after being banged up for a good part of last season. Sieve returns after averaging a tick over 13 points per game last winter and Steele and Gossett are the most improved players on the team, Feasel said. Junior forward Austin Brown is also back, as is junior guard Jake Elmore. The Braves improved their record each of Feasel’s first two years at the helm, and expect to continue to trend in the right direction. Winning the OCC is another goal. In order to do that, the Braves will have to contend with some solid squads. “Liberty is loaded … probably the favorite, and Westerville South and North might be the next two,” Feasel said. “Westerville Central has four move-ins, they’ll be good, and Orange is good. Olentangy opens the season with a league showdown against host Westerville North Friday night at 7:30 p.m.